Also found in: Dictionary, Thesaurus, Legal, Acronyms, Idioms, Encyclopedia, Wikipedia. A metallic element, atomic no. 26, atomic wt. 55.847, which occurs in the heme of hemoglobin, myoglobin, transferrin, ferritin, and iron-containing porphyrins, and is an essential component of enzymes such as catalase, peroxidase, and the various cytochromes; its salts are used medicinally. For individual salts not listed below, see ferric and ferrous entries. (Fe) (i´ern) chemical element, at. no. 26; it is an essential constituent of hemoglobin, cytochrome, and other components of respiratory enzyme systems. 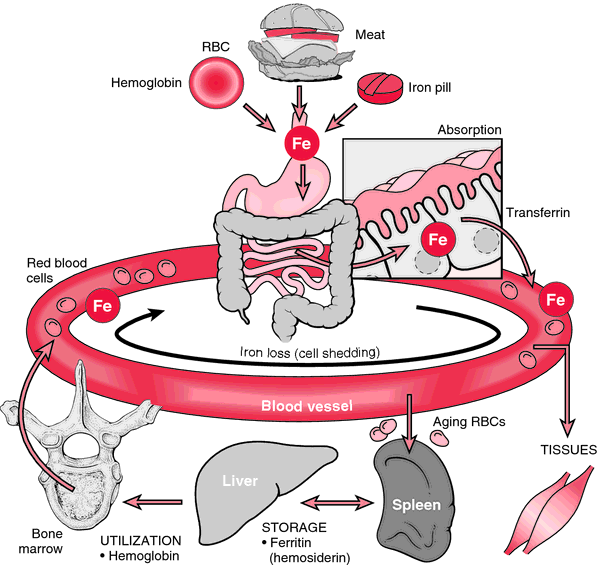 Depletion of iron stores may result in iron-deficiency anemia, and various salts or complexes of iron are used as hematinics, including i. dextran, i.-polysaccharide, i. sorbitex, and i. sucrose. a common metallic element essential for the synthesis of hemoglobin. Its atomic number is 26; its atomic mass is 55.85. Iron salts and complexes, including ferrocholinate, ferrous fumarate, ferrous gluconate, ferrous sulfate, and iron dextran, are used to treat iron-deficiency anemias. Iron-binding capacity, total iron-binding capacity, TIBC A metallic element–atomic number 26; atomic weight 55.8 essential to life, bound to Hb and responsible for O2 transportation–total iron refers to the amount of iron actually present in serum; iron and TIBC are performed on autoanalyzers Ref range Iron, 40-180 µg/dL; TIBC, 250-390 µg/dL. See Total iron-binding capacity, Transferrin. A metallic element, atomic no. 26, atomic wt. 55.847, which occurs in the heme of hemoglobin, myoglobin, transferrin, ferritin, and iron-containing porphyrins; an essential component of enzymes such as catalase, peroxidase, and the various cytochromes; salts used medicinally. An element essential for the formation of HAEMOGLOBIN. Lack of iron, or excessive loss leads to IRON-DEFICIENCY ANAEMIA. Iron is provided in a variety of chemical forms for the treatment of anaemia and is usually taken by mouth. In urgent cases, or if oral therapy fails, iron can be given by injection. an essential micronutrient; present in the body in the oxygen transport proteins, haemoglobin (60-70% of total iron) and myoglobin (10% of total iron). Small amounts are present in the plasma, carried by the protein transferrin, and it is stored (as ferritin) in liver, spleen and bone marrow. A small component (around 2%) is used in metabolic systems (cytochrome C, in mitochondria). Elite and recreational athletes undertaking hard training have a higher requirement and turnover of iron than less active people and quickly deplete iron stores which if untreated can lead to iron deficiency anaemia, severely impairing aerobic performance. n an essential mineral and element (Fe) found in leafy greens, meat, beans, peas, blackstrap molasses, and enriched breads and cereals; used as a supplement to relieve conditions associated with dietary deficiency and to enhance athletic performance. Excessive iron supplementation may also increase risk of cardiovascular conditions. A metallic element that occurs in heme of hemoglobin, myoglobin, transferrin, ferritin, and iron-containing porphyrins and is an essential component of enzymes; its salts are used medicinally. n a common metallic element essential for the synthesis of hemoglobin. Its atomic number is 26 and its atomic weight is 55.85. Normal blood levels range between 60 and 190 micrograms. Q. Why do I need an iron supplement? I am a 22 year old woman and my doctor told me that I need an iron supplement. Why? Q. What is the recommended intake for iron? I had a blood test recently which detected I have iron deficiency. I wanted to know what is the recommended intake for iron and which foods are rich with iron? A. Adult males need to consume about 8 mg of iron per day and females (not pregnant) need to consume about 18 mg of iron per day. There are two forms of dietary iron: heme and nonheme. Heme iron is derived from hemoglobin, the protein in red blood cells that delivers oxygen to cells. Heme iron is found in animal foods that originally contained hemoglobin, such as red meats, fish, and poultry. Iron in plant foods such as lentils and beans is arranged in a chemical structure called nonheme. Q. Why do pregnant women need more iron? During my pregnancy my Doctor keeps on telling me I need to take an iron supplement. I eat healthy and eat meat, isn't that enough? A. How much iron you need during pregnancy depends a lot on how much you already have stored in your bone marrow, as well as how much you get daily in your diet. If you are a meat eater, you will need less iron than a non meat eater however you will still need an iron supplement since during pregnancy you need to consume a great amount of iron that is impossible to consume from food alone. Consult with your Doctor and tell him to run you a blood test. If he sees you have enough iron he might not recommend an iron supplement and will be satisfied with only a Prenatal vitamin, which also contains iron but less. Iron Works "Because young women are losing blood every month, they need to replace their iron to avoid anemia," says Dr. The incidence of the defect is aggravated by high levels of moisture in the molding sand and high iron temperatures. Regular exercise is associated commonly with a reduction in iron stores, but iron deficiency anemia is uncommon. Meanwhile, you may want to increase dietary sources of iron to insure that you are running on a full tank and can enjoy maximum progress from your hard training. At temperatures and pressures found at Earth's surface, pure iron has a structure called a body-centered cubic crystal. The microstructure of the CGI material is such that there aren't the stress risers and fault lines associated with gray iron, nor are there the thermal requirements characteristic of machining nodular iron. This is similar to the patterns observed for both stored iron levels and rate of myocardial infarction in men and women, especially between the ages of 20 and 50 years (4,5). In a cast-iron building, the weight is carried by a framework of iron beams. For most adult males and postmenopausal women, getting enough iron isn't a problem. Iron: are we getting too much? Tailored to enterprises using Virtual Iron for server and network consolidation, Reflex VSA adds a layer of protection inside the virtualized network, detecting and preventing threats such as DoS attacks, virus and worm propagation, and access violations. Charge--The material contained in a given steel furnace melt, such as a mixture of scrap metal and pig iron in an electric arc furnace. Uncertainties exist to exact roles the two elements play in gray iron. How do manganese, sulfur levels affect gray iron properties?